Mortal Kombat XL isn't the most popular game on PC, especially given support for the game was dropped in January, however Ed Boon is listening. 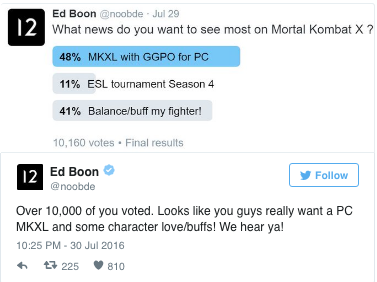 In a recent poll on Twitter the creator of Mortal Kombat asked fans "What news do you want to see most on Mortal Kombat X ?" Over the weekend 10,000 people voted and predominantly players want a lag free experience, specifically Good Game Peace Out. This is a middleware designed as a close to lagless experience. Mortal Kombat XL is now available for Xbox One, PS4, and PC.